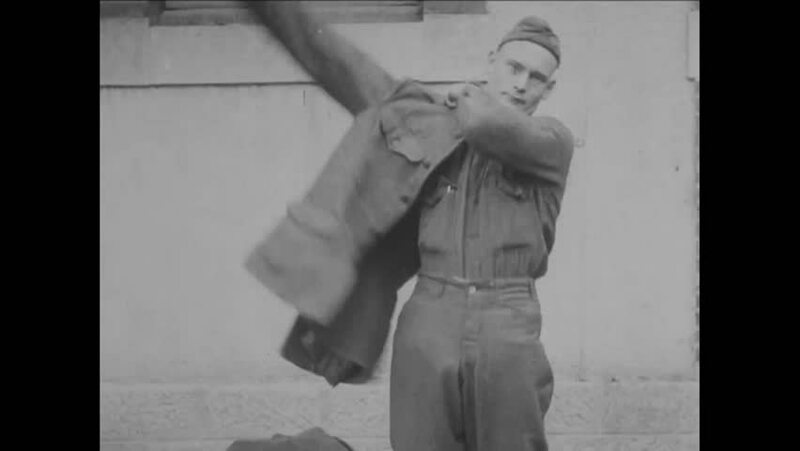 CIRCA 1918 - A soldier puts on his new uniform. hd00:13UNITED STATES 1940s: Boy stands on ladder, hangs decorations / Boy takes ladder downstairs / Boy walks downstairs with ladder. hd00:30CIRCA 1940s - Members of the Civilian Army train and shoot a rifle. hd00:16UNITED STATES, 1940s: men paint metal on car and put wheel on. Boy tries to put wheel on car. 4k00:18tourist travel photographer photographing at sunrise from a beach hut balcony at resort. With old school film camera.